Awhile back I came across this photo on Pinterest. And I thought to myself, "Wow, I love those shutters! I should make some!" and then thought nothing more of it. 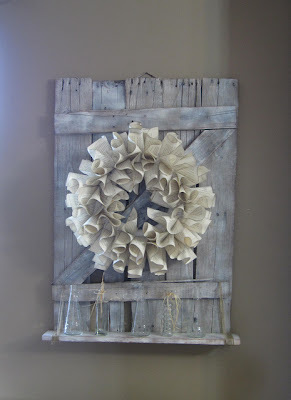 Then last week Melinda shared her barn door shelf on WYLTC. And that sealed the deal. I went that afternoon to pick up supplies. 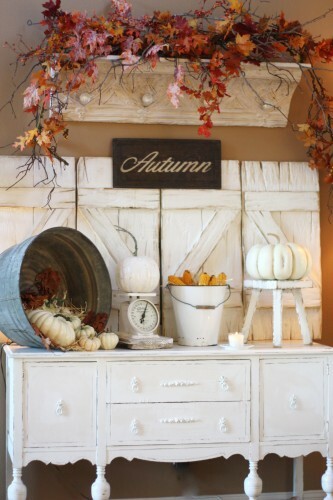 I whipped out a couple of barn door shutters and pulled out my fall decor, and now my mantle looks like this. I love that I was able to make them custom for my space. They are the same height as my mirror giving me a window look. I went with a green color because 1) I wanted a fun color and 2) green would go good with any season. I went out of my comfort zone on the finish of these and used a glaze instead of a stain over paint treatment. It was a lot of fun trying something new and I love how it turned out! If you want to make your own, they seriously couldn't be easier! All you do is take a 1x3 board and cut it into your desired lengths. Then take a 2x1/4 inch slat and make your Z. My boards were 23" tall. The two short slats were 10" long and the cross slat was about 16" long with a 31.62 degree angle cut. Your measurements will depend on the size. Then I just laid it on the ground and used gorilla glue to glue it together. It worked like a charm! This was my first time using Gorilla Glue too, and I will say I was impressed! Then finish however you want. Like I said, I used green paint and a brown glaze.